‘Sporty’, ‘girly,’ ‘minimalist’, ‘alternative’, ‘edgy’, ‘luxe’ ‘bohemian’ ‘casual’, ‘formal’- would you use any of these words to describe your style? It’s something I’ve been thinking a lot about lately. Especially since I’ve started a blog which mainly focusses on fashion, I’ve been trying to figure out exactly what my ‘style’ is and to be honest with you…I’m struggling. A lot of fashion bloggers I follow seem to have a set style, which coincides beautiful with their themed Insta pages and provides their followers and readers with fashion inspo they too are likely to love. Of course this is absolutely fab if it works for them, but over the years I’ve found I like to experiment with clothes and never stick too rigidly to one set style. I like to wake up and decide on the day what I fancy wearing- one day it might be an all black ensemble, but other’s I like to add a lot of colour. I don’t like to limit myself too much. If you’ve read one of my latest posts ‘My blogging experience so far’ you’ll know that one of the main aspects of starting this blog that I’m enjoying is that I’m getting the chance to explore my style. This blog is turning into an amazing little space for me to experiment with clothes, style outfits and ultimately get creative- and I’m loving it. I had this idea recently that I wanted to do a three part blog series called ‘exploring my style’ and bring you 3 looks which are completely different, but I love equally, to show you that it’s okay to experiment with clothes which push you out of your comfort zone. So here we, with part 1. You know the saying ‘go hard or go home’ well I guess you could say this about my first choice of outfit. I based the outfit around this beautiful, and somewhat crazy, multi coloured fluffy coat which I automatically fell in love with when I saw it on the Misguided website. I kind of reminds me of a bright pink Big Bird (Sesame Street reference for anyone wondering what on earth I’m on about!). The mix of colours and textures are beautiful and I knew it would make the perfect statement jacket. You can shop it on their website, here. Next, I decided I wanted to mix up the textures and pair the jacket with a white slogan t (because we all know how much I love a slogan t) and a leather skirt. 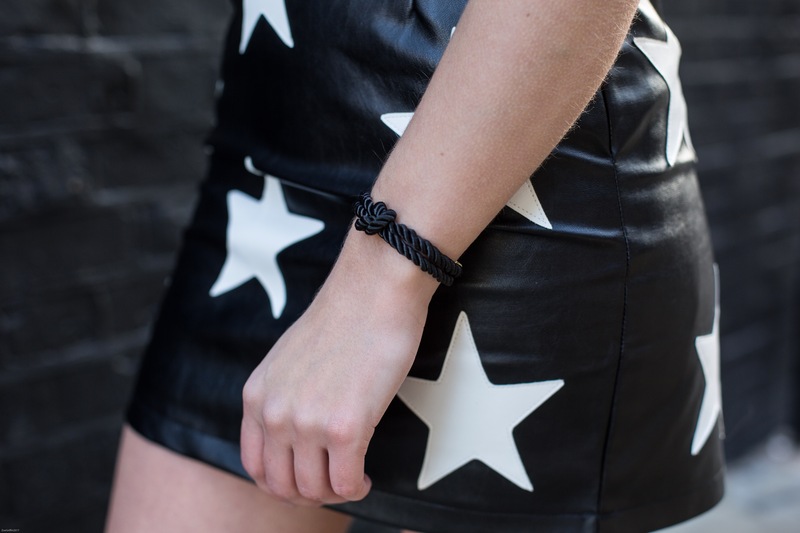 When I was browsing through the Missguided website I came across this amazing star print leather skirt which I was obsessed with! At first I wasn’t sure if this was a bit much and if the star print would clash with the jacket, but I soon decided I didn’t care and I actually loved the fact that it was a bit of a crazy combo! You can shop it on the website, here. I also wore my Leo Mazzotti Bracelet, which I was kindly gifted. It’s a really beautiful design and goes perfectly with this outfit! It comes in a large range of colours, if black isn’t to your fancy! Check them out, here. Next up is the slogan T… I mean there’s not much to say here other than you seriously can’t go wrong with a white slogan T and this one from, also from Misguided, is really cute! It came in quite an oversized fit, so just beware- I struggled to tuck it into the skirt as it was pretty long! It also meant that it made the skirt ride up a bit (hence why the skirt is a tad shorter in some pics than I would ideally like). You can grab a bargain for only £12 on the website, here. For a while now, I’ve wanted a bag with a metal loop handle. I’ve seen them everywhere and I think they make the perfect accessory! I had a look on some of the online websites such as, Misguided, PLT, Boohoo etc and decided to opt for this cute black hexagon shaped one, with gold hardware from Misspap. I thought the shape was really unusual, but still really wearable with it being black! You can shop it on their website, here. 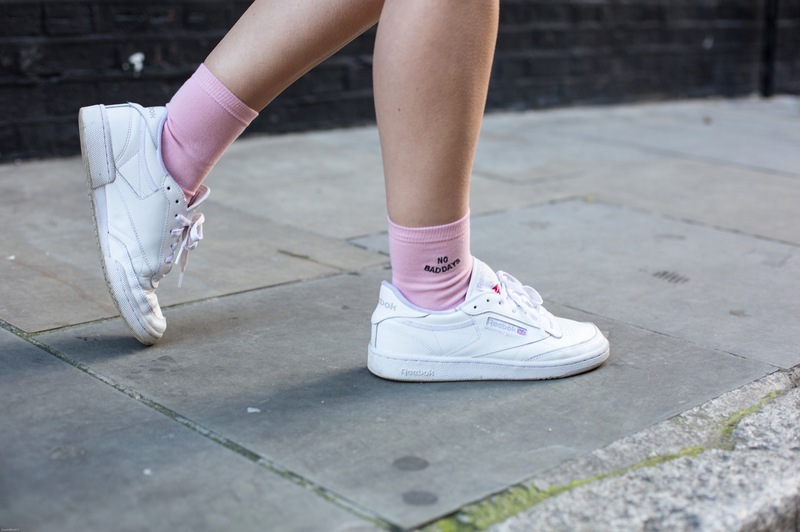 Finally, to add an extra pop of colour I decided to get these super cute pink socks from Urban Outfitters. They’re the perfect Monday sock with the slogan ‘no bad days’ as a little reminder to always try to stay positive, which is easier said than done on some days I know! Pick them up for £6, or buy two pairs for £8, on the Urban Outfitters website, here. Then, to keep the outfit more casual I wore my white Reebok trainers. I’m generally more of a trainer kinda girl than heels and I feel like it gives the outfit a bit more of a casual ‘edge’. Also, I just want to mention how amazing Zoe Griffin is, who took all these fab photo’s. It was my first time working with her and she was so lovely and made me feel really comfortable. It was like we’d known each other for ages and we had a really fun shoot! I mean, we even managed to find a bin that matched the pale pink colours in outfit, so of course we made the most of the location and took some pictures there! (The ultimate definition of ‘doing it for the gram’). You can check out her photography Instagram page out at, @zoegriffinphoto and her website http://www.zoegriffinphotography.co.uk. And that’s it! I absolutely loved this outfit and it definitely brought out my sassy side! It was nice wearing something that was a bit more daring and I can’t wait to continue with experimenting with colours, textures and prints! Keep a look out for the #2 part of this series which will be up soon! *Disclaimer- I was kindly gifted the bracelet in this post from Leo Mazotti. However, all opinions are my own and I was not paid to write this post. "DISCOVERING MY STYLE #2- WITH ROKIT VINTAGE"